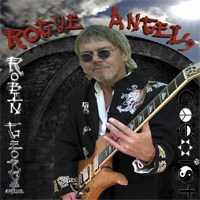 ROBIN GEORGE has over the past thirty years enjoyed commercial success (“Heartline” was a hit single the world over), written songs for artists including Robert Plant, Phil Lynott & Glenn Hughes, and now has a new solo album “Rogue Angels”. He describes how during the making of the album: “inspiration relentlessly flowed, from my heart to my guitar”. Enjoy classic rock from the gifted singer-songwriter and guitarist. ...the album contains a lot of brilliant guitar, supported by a good rhythm section. 'RedOut' has a LED ZEPPELIN feel with a worthy guitar solo, which is very supportive. 'Go Down Fighting 2018' is a kind of wild boogie where the voice of Robin GEORGE is very convincing, just like his guitar. An AC/DC vibe is evident thanks to a recognizable riff on 'Dark & Stormy Night'. GEORGE teases the guitar again on 'Dancing Shoes Again', he really does not need help to make his music swing, except from his drummer. A last box of riffs with 'Love Is Blind'. An album where we can only dream of being as good a guitarist as him. This is one of those cases where a musician hits his prime at a later point in his career. Instead of burning out or fading away, George's music seems to become more energized and magnetic. We can't imagine any fan of real rock music not having an immediate attraction to cuts like "Wild Eyed Beauty Queen," "Rush," "Red Out" "Surreal Dream," and "Love Is Blind." Featuring some of the best rockin' tracks we've heard in 2018, Rogue Angels is a solid and direct HIT. Highly recommended. TOP PICK. Robin is an intriguing artist who even wrote for the likes of Robert Plant, Phil Lynott and Glenn Hughes and has many an album out in his own right. He fires up on eleven cuts on this brand new release that feature Charlie Morgan too on drums with highlights including the sticking in your head opener 'Wild Eyed Beauty Queen' to the blues of 'Love Is Blind'. In between you'll come across numbers like the catchy title track 'Rogue Angels'; 'Surreal Dream' that puts me in mind of 'Breath' by The Prodigy in part of the chorus or the cheesy rocky poppified 'Dancing Shoes Again'. Over a vast and varied career Robin George has created a hugely eclectic body of work, but with the hard rocking, blues edged energy of Rogue Angels it really feels like this singer, guitarist and songwriter is making music that completely satisfies his creative need. Surely it's no coincidence that it also comes across as one of the most impressive albums he's put his name to. Over the years, since debut solo album, Dangerous Games (1985), George's songs and production have gained an instantly identifiable style. Themes of love, peace and perseverance are now hardwired into his lyrics...touchingly referring to maternal inspiration on 'Play Nice', and resurrecting 'Go Down Fighting's ode to the common man, on this 2018 version. Musically, he has perfected the "Alien" technique, where great melodies burst forth from an arrangement seemingly stitched together from fragments of guitar, bass and drum harmonies...especially effective on 'Surreal Dream' and 'Wild Eyed Beauty Queen'. Where so many Eighties AOR survivors come back with albums mired in the sound of dead horses being flogged, George gives the genre's faded grandeur a fresh coat of paint. Rogue Angels is a rare treasure, an original and innovative work of art, which seduces us subtly, throughout our mysterious journey. A Surreal Dream of Rogue Angels and Wild-Eyed Beauty Queens striding through Dark and Stormy Nights; lyrically, we're enchanted as we leap between light and shade. Musically, we're enthralled as the maestros, Robin and Charlie, power through this mind-blowing rock symphony. ...Surreal Dream whisks us into the weird and wonderful 'bitter sweet' world caught between dreams and nightmares. It combines mesmerizing Eastern rhythms with spectacular 'pedal to the metal' guitar and mesmerizing tribal drums. The enchanting, whimsical lyrics are full of humour as witches and Rogue Angels consort with the Bilston Market cowboys! Deeper into the dreamscape, One Dark and Stormy Night is pure delight. It's a rock n roll lullaby you never want to end, a bedtime story you gotta dance to and a tune you just can't get outta your head all night! Robin George played for over thirty years in the shadow of well known musicians such as Brian May, Roy Wood or Robert Plant. Time for recognition: his recent solo album 'Rogue Angels' on Angel Air Records, with melodic slide guitar and strong riffs, will blow you away.